Jenny Stott demonstrates how to remove excess hair from a greyhound. ANYONE walking into Jenny and Stuart’s Stott’s home is guaranteed a warm welcome. 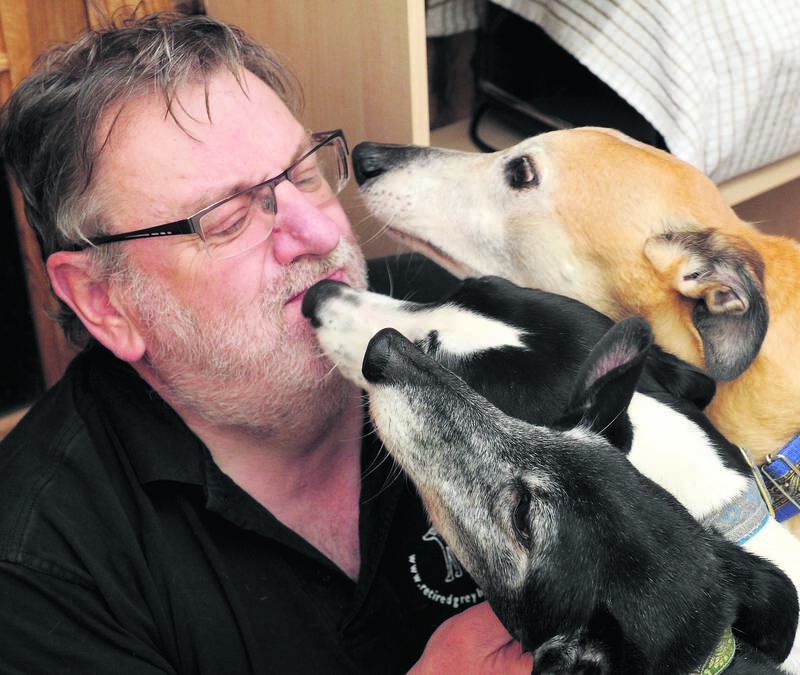 The husband and wife team run the South Lakes branch of the Retired Greyhound Trust. While the dogs in their care do have their own home in the garden they have no problem making themselves comfortable in Jenny and Stuart’s house. It has to be said that being greeted by seven or eight greyhounds is a real treat thanks to their manners towards each other and visitors. There is no fighting, no barking, just a bit of jostling to get to the front for attention. These gentle, endearing dogs are all long limbs, slim bodies and delicate pointed faces. Spending time in their company reveals their extremely engaging personalities. Most may have come from a racetrack, but they fit into the family home setting with ease. Jenny and Stuart Stott with Sandy. Talking about her beloved greyhounds, Jenny said: “They tend not to bark much, some don’t bark at all, and they usually settle into their home which sometimes takes just an hour. As an example Jenny points out one of the greyhounds in the living room called Dream. She is happy mingling with the other dogs and checking out the new people, even though she has only been with Jenny and Stuart a week. Stuart with, front to back, Indy, Lena and Sandy. Even better news is that she will be going to her new permanent home in a few days’ time. Jenny also points out one of their own greyhounds, Sandy, who they have had since she was four. Sandy is a completely different dog to the one Jenny first took on. Now Sandy comes up for a pat, but whatever happened to her before she still carries the many scars in the form of dark marks all over her golden-coloured body. In the dog house in the garden they have their own soft beds, fans and heaters. Talking about the greyhounds, Jenny said: “Most of the dogs come from the trainers who like to bring their greyhounds here because I keep in touch with them once they have been re-homed. “The trainers are very proud of their dogs and how they are getting on. I am very happy to work with the trainers because they are a big help. “They will even work with me to get dogs here who are not being looked after properly. Other greyhounds are brought in as strays, some have been re-homed once before but come back, sometimes through owners becoming too ill or elderly to look after them. They do get people wanting a dog because of its colour, but they don’t get far with the Stotts. Jenny adds that at the moment there are a lot of black greyhounds coming into rescue centres because of the siring abilities of two black greyhounds, Head Honcho and one of his offspring, Top Honcho. Between them they sired around 15,000 offspring, many of whom are also black. 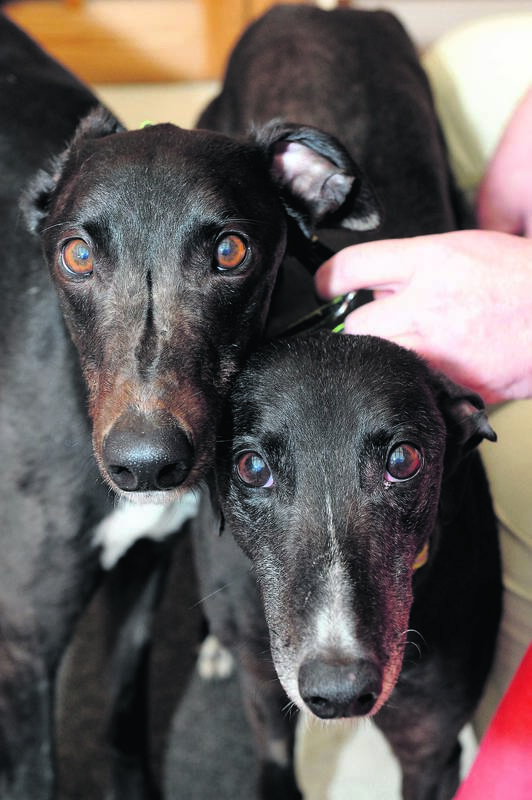 The couple have been fostering and re-homing greyhounds for 10 years as a tribute to one of their first dogs, Penny. The youngest greyhound they have now is 10 months and the eldest 12 years. Talking about greyhounds in general, Jenny said: “When people come and see us looking to adopt we have a chat to them generally to see how much they know. “One of the things they do need to know is that greyhounds can go from 0 to 40mph in about five steps, but they always warn you that they are about to set off through their body language and their ears. “Greyhounds are bred for three things, their speed, good health so there are no genetic problems at all because they don’t want those sort of things, and for their temperament. “They have to have the right temperament to race on the track because of all the rules, including not being allowed to touch other dogs, otherwise they will be disqualified. “Because of that temperament they are extremely popular dogs with pets for therapy. They are very good with children and very astute with people. She explains that in one case of a greyhound in a home where a little boy had cerebral palsy, the child would only go to sleep with the dog snuggled up beside him. Although greyhounds wear muzzles when racing this is only to keep them focused, not because they are aggressive. 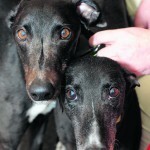 Greyhounds are also the only dog who recognise their own kind and be able to pick them out from other dogs. Although they are very laid back, almost lazy, Jenny warns they do come very much alive when they feel like it and they cannot be left alone all day. They need to be able to go to the toilet when they have to and it is just not fair on the dog to be left alone that long. When it comes to food they will eat fresh meat, including mince and chicken. Doses of cod liver oil are good for them, plus they love it. Jenny adds they also love sardines in tomato sauce or oil, tuna and pilchards. There is also something else that greyhounds love and that is being “brushed” or “scraped”. Making the transition from the racetrack and an outdoor kennel to a home means their coats will become even finer to fit the warmer conditions. To help tidy the greyhounds up when the fur starts to shed Jenny uses a proper scraper blade which the dogs love so much that they queue up in the garden for their turn. For further details or to make inquiries about adopting a greyhound please call Jenny and Stuart on 015395 52394 at Beech Hill House, Witherslack, or go on to their website.